Avago Technologies, a leading supplier of components for industrial, automotive, and renewable energy applications, recently announced the availability of a new family of optically-isolated voltage sensors. This family is the industry’s first series of optical isolation amplifiers based on sigma-delta modulation that is specifically optimized for voltage sensing. 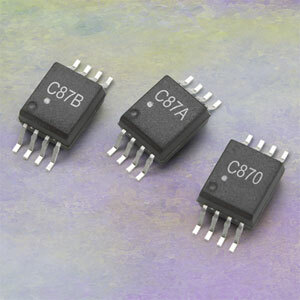 Targeted for applications such as sensing voltages in electronic power conversion systems commonly found in motor drives, switching power supplies and renewable energy systems, as well as sensor interfaces such as NTC thermistor isolation in IGBT modules, the ACPL-C87B, C87A, and C870 provide designers with a 2-V input range and high 1 GΩ input impedance. For general applications, the ACPL-C87A(±1% gain tolerance) and the ACPL-C870 (±3% gain tolerance) are recommended. For high-precision servo and motor drives, the ACPL-C87B (±0.5% gain tolerance) can be used. The voltage sensors features a 1V/V unity gain with low gain drift of -35ppm/˚C and non-linearity is kept to within 0.1% max. The voltage sensors include an active-high shutdown pin which reduces the IDD1 current to only 15mA during standby, which makes the sensors well-suited for battery-powered and other power-sensitive applications. Avago Technologies' Optical Isolation Amplifiers have been using advanced Sigma-Delta modulation technology and chopper-stabilized amplifiers to provide accurate, safe, and reliable current and voltage sensing for over 2 decades in motor drives and power converters. Differential outputs on the new devices provide unequaled isolation-mode noise rejection, low offsets, high gain accuracy and stability, and a wide signal band width of 100 kHz. The built-in reinforced safety insulation and high CMR (common mode rejection) performance prevents erroneous voltage measurements and ensures reliable operation in a noisy environment. The optically-isolated voltage sensors have a 15 kV/µs common-mode transient immunity. Safety approvals include CSA and IEC/EN/DIN EN60747-5-5 with a VIORM of 1230 Vpeak. Additionally, the sensors are UL recognized with 5000 Vrms for1 minute per UL1577. The ACPL-C87xvoltage sensors are housed in stretched 8-lead SO-8 plastic packages with 8mm creep age and clearance that meet worldwide regulatory safety standards. The sensors also have a wide operating temperature range of -40 to +105 °C. Samples and production quantities are available now through Avago’s direct sales channel and worldwide distribution partners. More information about Avago’s isolation amplifier and isolation products can be found at www.avagotech.com/optocoupler. Avago Technologies is a leading supplier of analog interface components for communications, industrial and consumer applications. By leveraging its core competencies in III-V compound and silicon semiconductor design and processing, the company provides an extensive range of analog, mixed signal and optoelectronics components and subsystems to approximately 40,000 end customers. Backed by strong customer service support, the company's products serve four diverse end markets: wireless communications, wired infrastructure, industrial and automotive electronics, and consumer and computing peripherals. Avago has a global employee presence and heritage of technical innovation dating back almost 50 years to its Hewlett-Packard roots. For more information, visit www.avagotech.com.